10% off all teak shower benches and stools. Use coupon code Summer Fun for 10% off all teak shower furniture (not valid on outdoor teak furniture line). Decoteak shower benches provide a combination of elegance and practicality in bathroom furniture and shower seating. 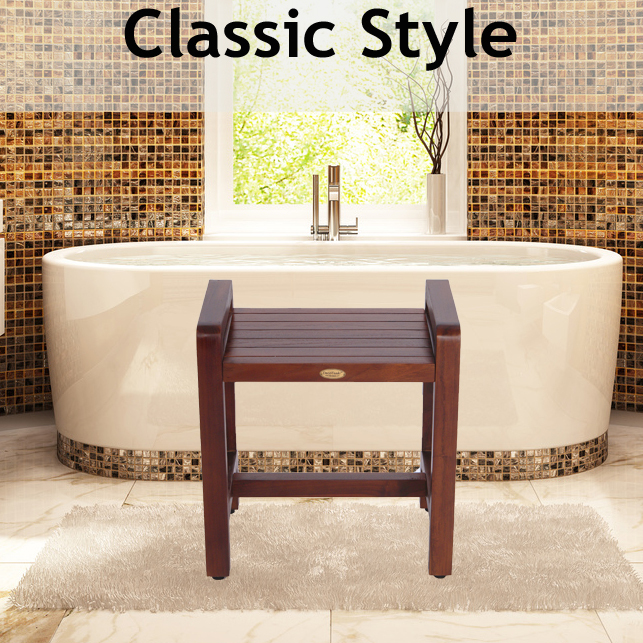 A teak shower stool can provide the perfect finishing touch for a shower without a built in shower bench. Decoteak provides a variety of contemporary teak shower benches, chairs, and stools in a multitude of sizes and styles. All DecoTeak shower seats provide the perfect combination of modern elegance combined with practicality. Your can find the perfect shower seat from our wide selection of styles and sizes. 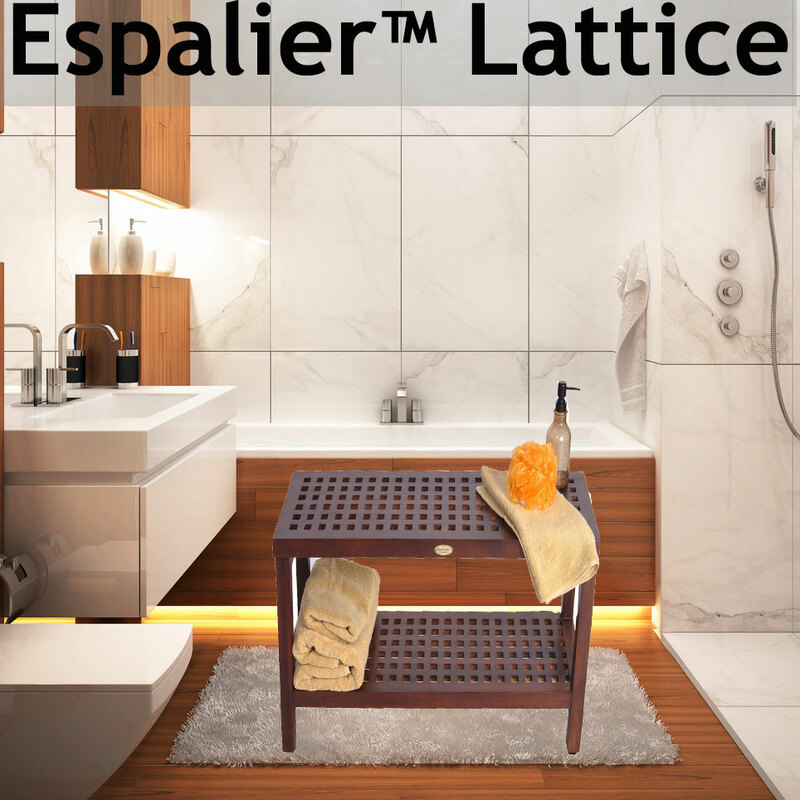 Many of our shower furniture incorporates leading ergonomic design research to make your lives not only more beautiful, but also more comfortable. 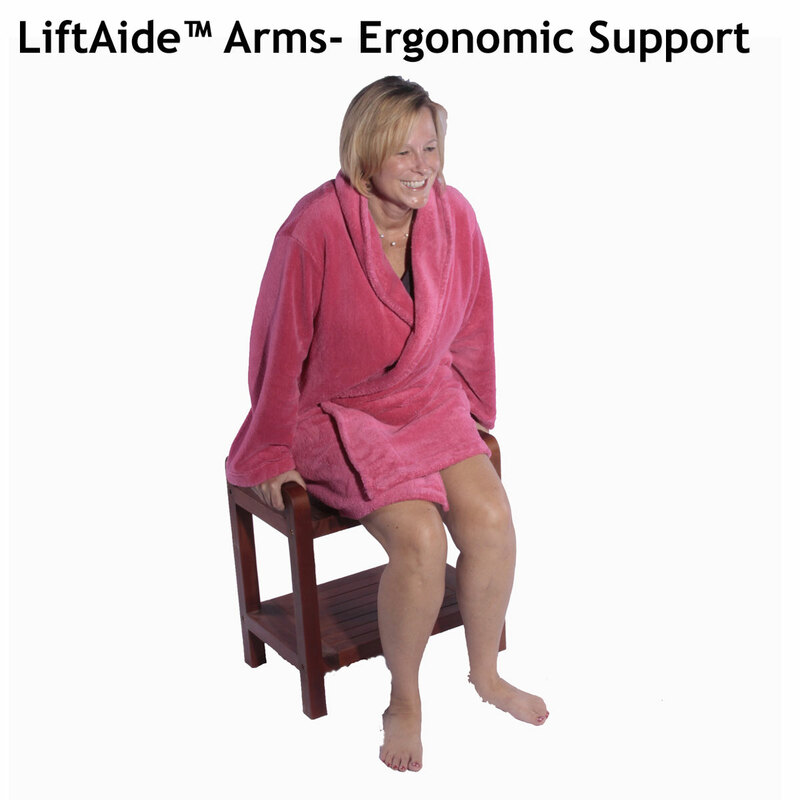 The arms, and raised seat heights on our shower chairs will make it easier, and safer for you to sit and stand in the shower. Regardless of your health you will appreciate the comfort that our teak shower benches provide to your shower and bathroom. Decoteak shower furniture ranges in size from 18" up to 35" in length. So regardless of the size of your available shower space you will find the perfect shower bench to complement your bathroom and shower decor. Whether you prefer modern, contemporary, or traditional designs you can find a shower bench that will coordinate with your bathroom decor and decorating. We recognize that modern bathrooms have become the showplace of the modern home. 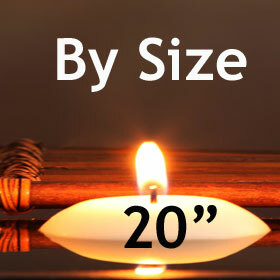 We designed our shower benches, chairs, and stools, with this in mind. 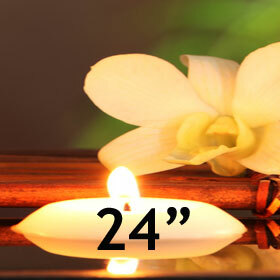 Our goal is to provide your the perfect combination of utility and beauty in bathroom furniture. Teak wood is the perfect wood for bathrooms and showers, and has been the wood of choice for moist environments for hundreds of years. Spa Style Shower Seating- Provides the rich look reminding you of luxurious spas. We are proud that many leading hotels, spas, and corporations, having ordered our teak shower products for their spas, health clubs, and locker rooms. 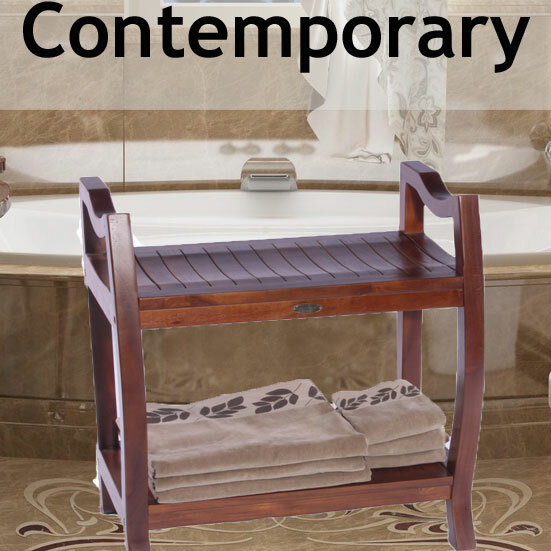 Asian Style Shower Furniture- A wide variety of teak benches that have Asian influenced design elements fused with Western practicality. Grate Style Benches & Stools- Teak stools that provide a classic criss cross look that is a fusion of contemporary with classic traditional refined lines. 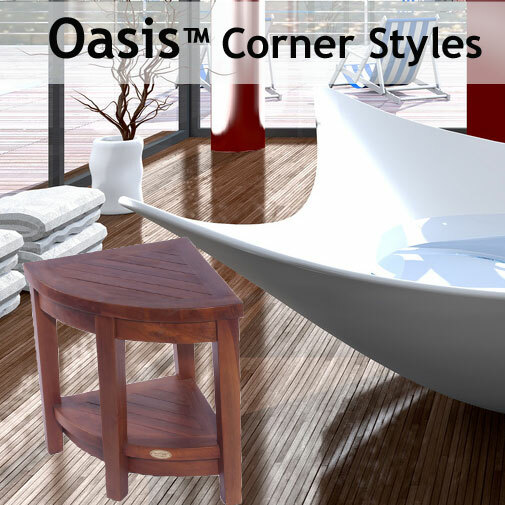 Corner Shower Benches & Chairs- Utilizing the corner of your shower is the most effective utilization of limited space. 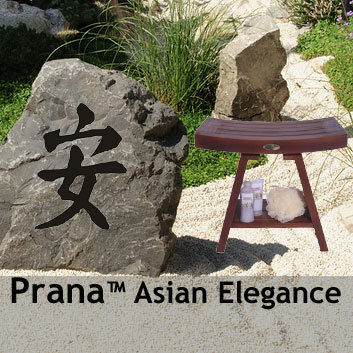 Placing a teak stool in the corner provides elegance combined with functionality. 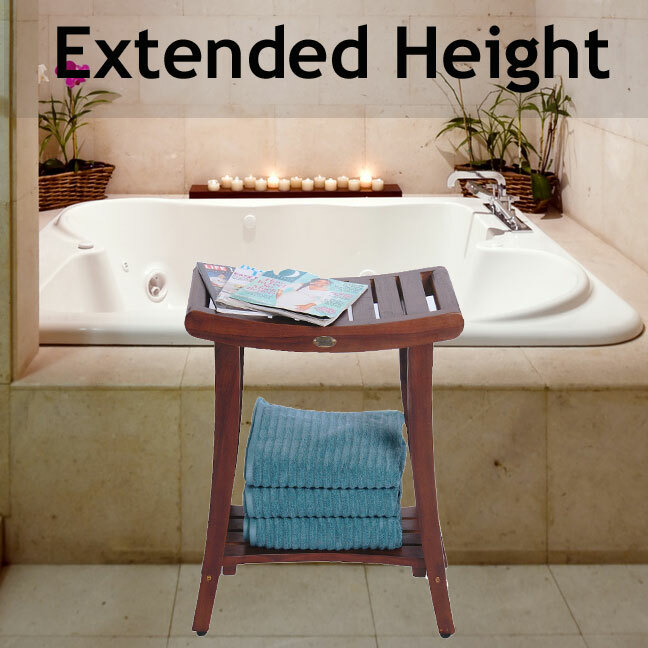 A corner is also a great place to tuck a teak stool to use for shaving your legs in the shower. Extended Height Shower Chairs- Decoteak is the first company to offer extended height shower chairs designed with ergonomic design features and an innovator in this area. The extended height shower chairs and benches provide ease of sitting and standing for those recovering from surgery, elderly, tall people, and everybody else! All of Decoteak's shower benches, chairs, and stools are constructed by skilled village craftsmen on the island of Java, Indonesia. We work with factories in small rural villages where the villagers have often been involved in furniture making, crafts, and wood carving for generations. They take great pride in their work, and we are proud to be able to offer these teak shower benches, chairs, and stools to customers in the USA and Canada. 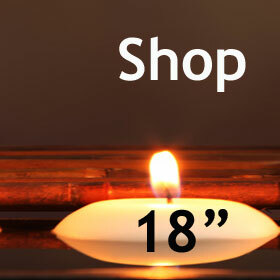 Decoteak is a small family owned, and female run company. 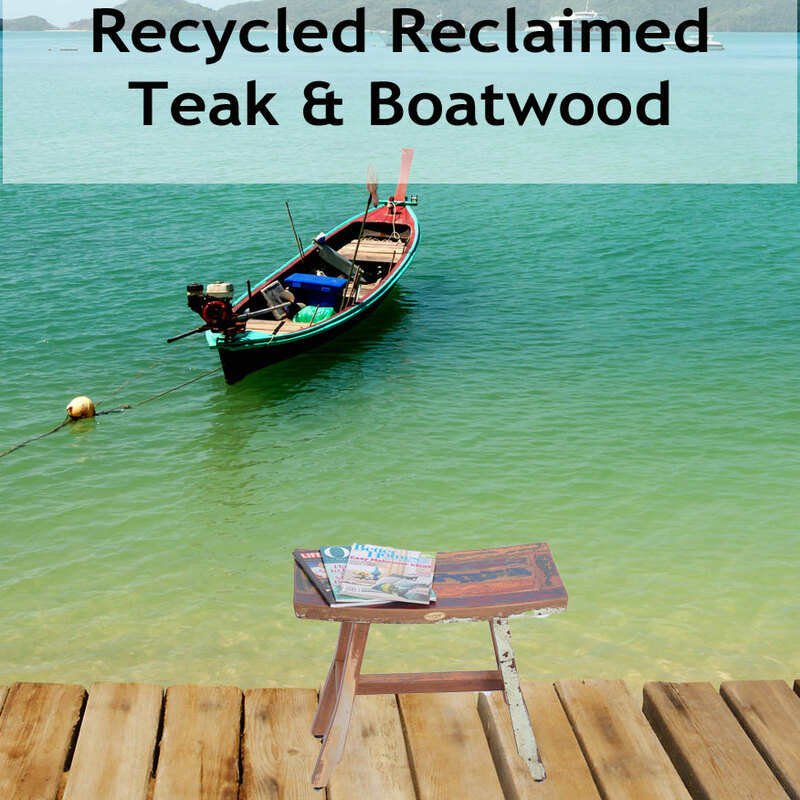 We take great pride in the quality of our teak products, and the customer service we provide. 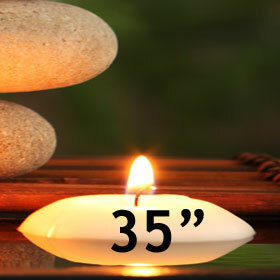 The owner has been involved in small family businesses her entire life, and understands that a successful long term business can only be built on satisfied customer. We commit that we will always do everything we can to assure your satisfaction with our teak shower bench, chairs, and stools. We know and understand that when you order one of our teak furniture products that you eagerly await its arrival with high expectations. Our goal is not to dissapoint you when it arrives!